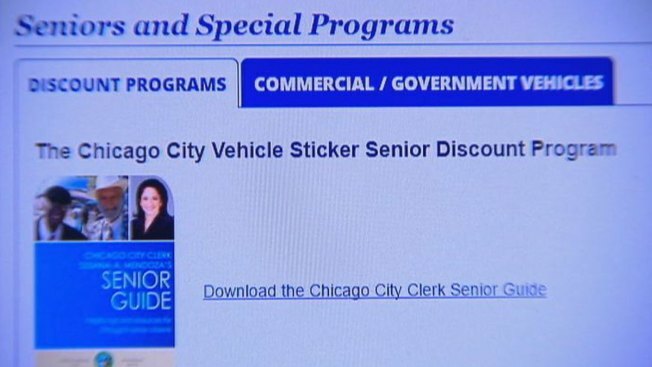 The City of Chicago takes in $120 million from the sale of vehicle stickers annually. Most drivers pay $85 and up, but a city ordinance allows for drivers 65 and older to get a rate of less than half that amount. It's a discount that disappeared for some recently, raising the price and raising questions for some of the city's seniors. In the North Park neighborhood, Richard Kimball said a courtesy reminder that recently came in the mail from the city prompted him to beat a deadline that was quickly approaching. It was time to renew his city sticker, which remains on a June expiration cycle for all seniors. But Kimball said the mailer listed a price quite different from his senior discounted price, which should renew year to year. It quoted him the $85 passenger price, rather than the $30.34 senior rate. "The difference -- it's a lot of money; like three or four months' water bills," Kimball said. Kimball said on multiple attempts, the City Clerk's website wouldn't recognize his senior discount -- spitting back the full price. Three rounds of email and 10 days later, he decided to pick up the phone and call the City Clerk's office. "During the course of that conversation, the person I spoke to indicated they had a lot of problems," Kimball said. Kimball's 39th Ward alderman's office said they've heard the same complaint from "several, several" constituents. They believe many mistaken forms were sent to seniors. Kimball said that's what he heard, too, when called the Clerk's office. "At some point in the process, they managed to lose or delete some senior discounts," Kimball said he was told. But a spokesperson for Clerk Susana Mendoza disputed any widespread problem with the mailers. Patrick Corcoran, Deputy Director for Communication & Policy for the office, estimated only one percent of the city's 250,000 senior drivers might be affected, a number that reflects the general population error rate. Corcoran said the clerk's website has a robust help section for seniors who he said are a priority for the office. "Ensuring our seniors receive their senior discount is a priority for the Office. We added temporary staff to help seniors over the phone during May, June and July. We have made special accommodations via the web and at our in-person locations and ward sale to make every effort to ensure they receive their discount," Corcoran wrote in an email to NBC 5 Investigates. Whatever triggered the mistake, Richard Kimball and the other seniors who've complained want their counterparts to know that in some recent city literature, the price isn't right. "OK. If I'm having this trouble, how many others are having this problem? Maybe they got a big bill and didn't realize it. That was my biggest concern," he said. Ald. Margaret Laurino's office said after repeated complaint calls, they began telling seniors to ignore the mailer and simply send in the discounted amount, along with a photo of their driver's license.